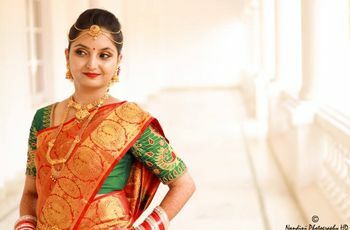 Mesmerising Hair Accessories Inspired by South Jewellery That Every Bride-To-Be Must Consider | Wedding Tips ARE YOU A VENDOR? Jewellery is an important part of every bridal look and your hair should be no exception for this royal rule. 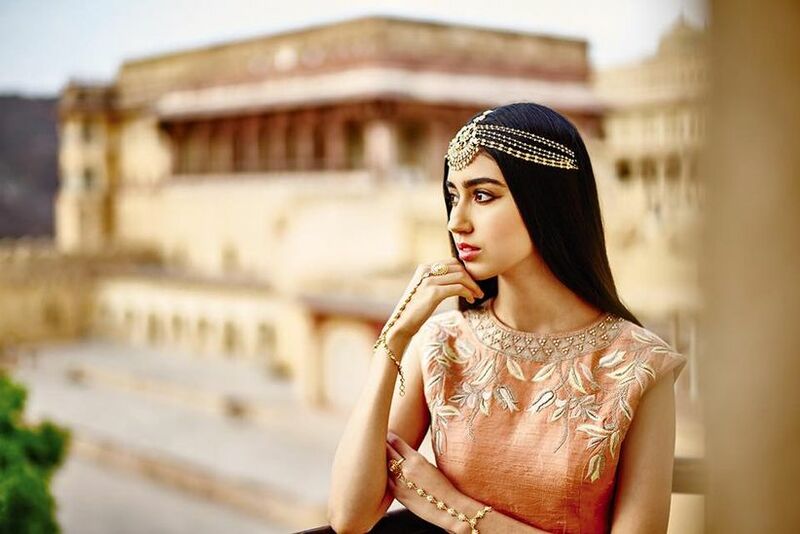 Take notes from these gorgeous hair accessories inspired by regal South jewellery. Solid gold, moulded in intricate patterns, creating motifs inspired by the divinity and encrusted with precious gemstones is all that South jewellery is about. Add this regal accessory to your hair to make even the simplest hairstyles look opulent and elaborate. 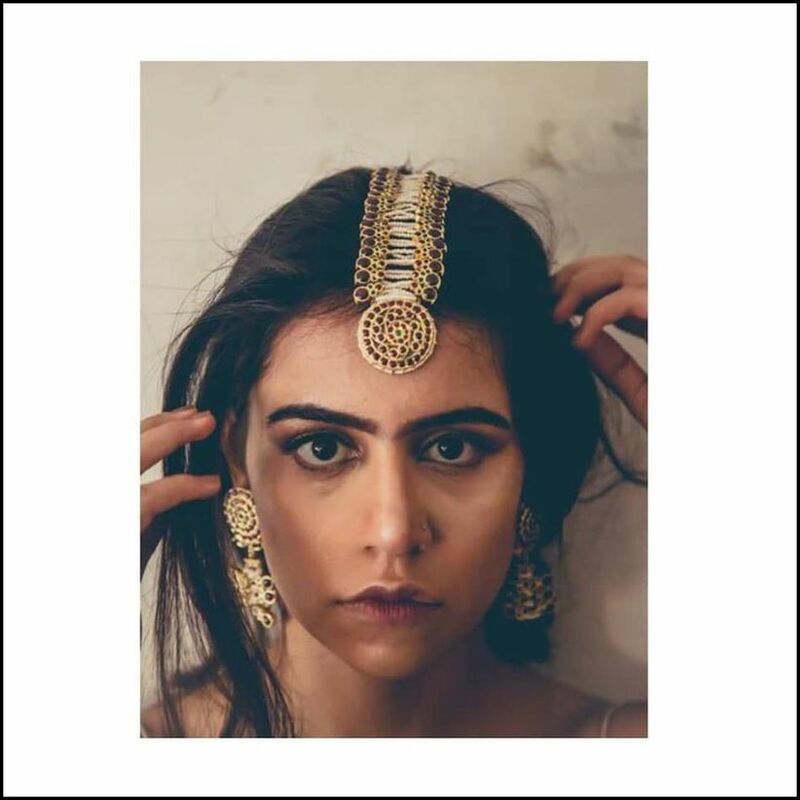 We have curated different accessories for our tresses that are inspired by pure South jewellery to inspire you to adorn them on your big day adding the essence of royalty in just the right amount. 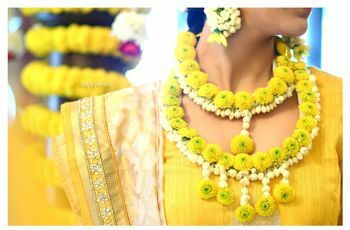 Pretty and precious Poola Jada (flower garlands) have been a part of the South Indian tradition for as long as we can remember. Accessories your bun with a Gajra style flower arrangement of jasmine and rose flowers embellished with an element of gold in the centre. This combination with making your bun look absolutely gorgeous and the fragrance of the sweet flowers are bonus points! Pearls have a delicate appeal and aesthetic that no other gemstone can match. Multiple strands of champagne pearls strung across your hair look elegant, poetic and have a romantic vibe to them. Pair this precious gem with petite white and green flower weaved through a messy braid for a fabulous hairstyle on your Mehendi or Haldi ceremony. Look like a Goddess when you adorn a magnificent gold disc hair bun accessory inspired by South jewellery. The intricate details moulded in precious gold metal require a great craftsman to achieve a defined design making it apt for the divine bride to adorn on her big day. Complete the bun styling by adding a crown of romantic red roses along the top of the bun. Crescent moon has a charming and alluring appeal to it and when it is brought down to earth, moulded with molten gold and encrusted with precious gemstones, it makes the perfect hair bun accessory for every bride-to-be to adorn on the celebration of her big day. Multiple crescent trails off precious gemstones like emeralds and diamonds make it look like it is borrowed from the stars. 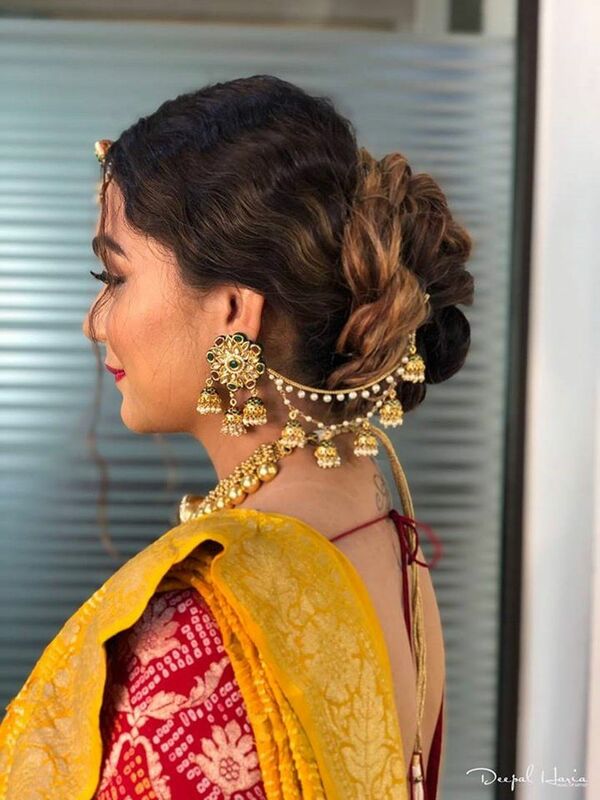 Adding a ‘shooting star’ effect are to this south jewellery inspired hairpin are the gold chain tassels that sway with the bride’s every move. 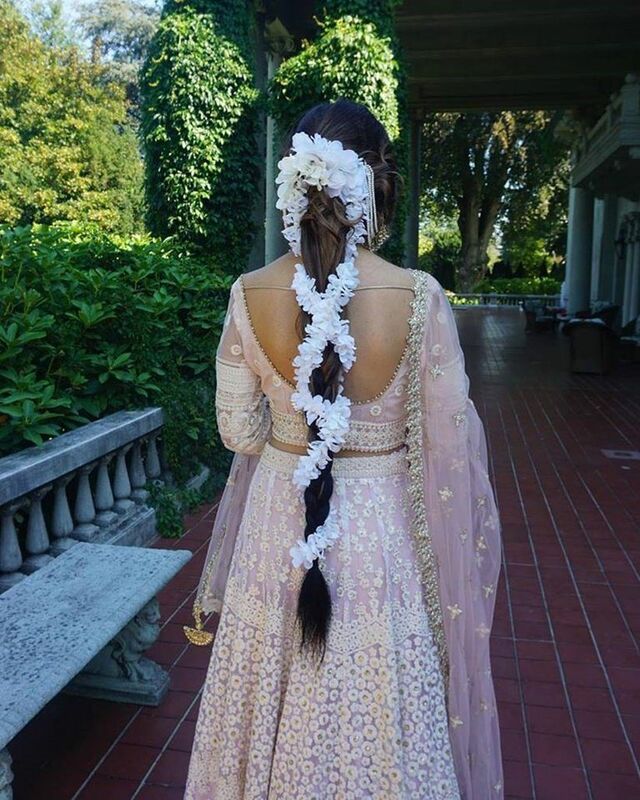 We just can’t take our eyes off this modern twist to a traditional Phool Jada. 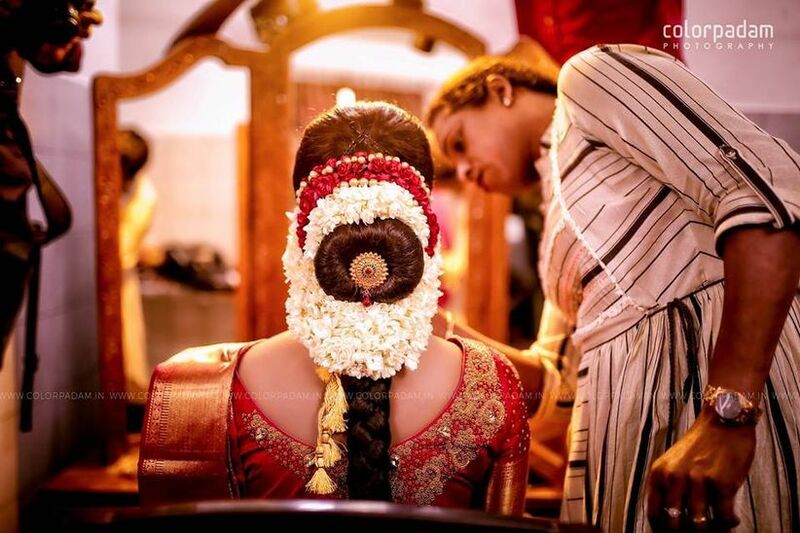 When it comes to south jewellery and bridal accessories, we know that a hair garland is a must-have. This floral garland style calls out to all the millennial brides with want to embrace their traditional roots with a minimalistic appeal that reflects their personal style and personality. Inspired by South jewellery, this is a magnificent Maanga Tikka starting at your forehead and going all the way back till the crown of your head meeting your braid or bun hairstyle. You can even adorn this piece with your left open by simply covering the end of the accessory with your luscious locks. 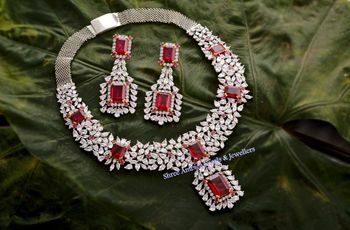 The fine details of micro pearls create a bridge life effect connecting the two lanes of precious rubies. The round emblem on the forehead encrusted with rubies and emerald brings the whole piece together. Jhumkis are the jewellery love of every bride whether she like minimal accessories or a completely OTT look. 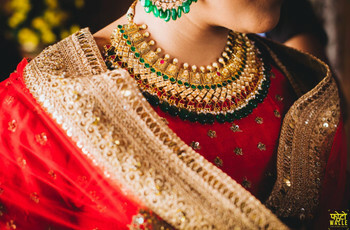 This style of south jewellery comes in all sizes and in a vibrant array of designs making sure that there is something for every bride. This pair of earrings doubles as a hair accessory with multiple micro Jhumkis trailing across the ear making its way into the centre of the bun. not only are these absolutely amazing to look at, but the rhythmic move and sound that comes with every little movement the bride makes are almost awe-inspiring. South jewellery inspired hair accessories can add a divine and regal touch to any hairdo. 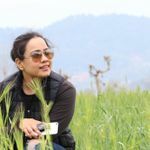 You can choose a hairstyle with a braid, bun or even loose hair let down, and there will be a south jewellery hair accessory style that you can adorn as a part of your bridal jewellery on your big day. 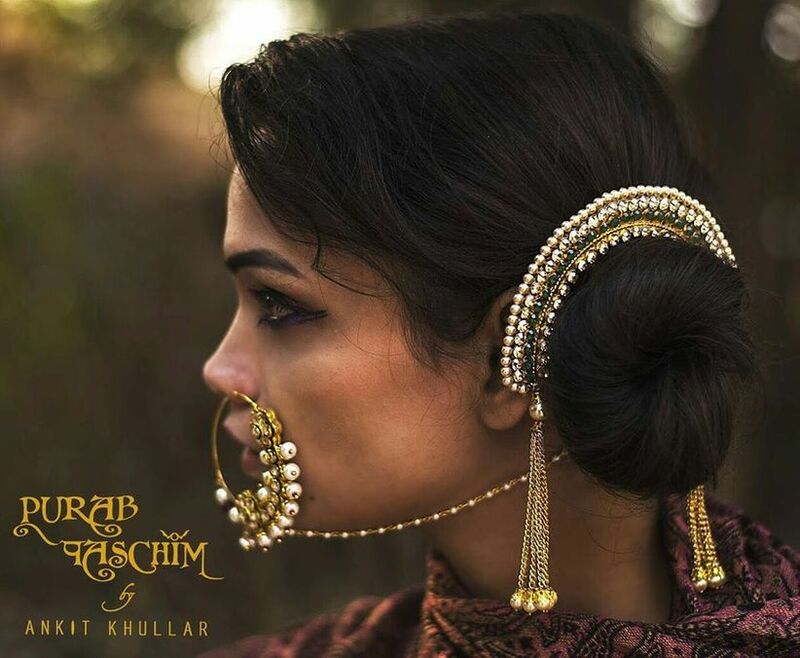 Flowers, pearls, gemstones and gold all come together to create these stunning hair accessories inspired by south jewellery and require a whole lot of excellence in its craftsmanship. 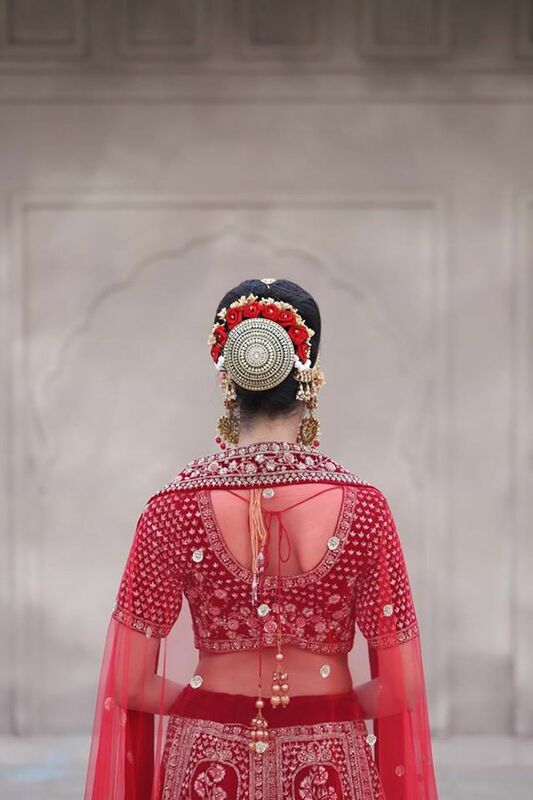 The sheer intricacy of the motifs in combination with their delicate aesthetic makes them truly breathtaking. Which one of these South jewellery hair accessories are you inspired to adorn on your big day? Let us know in the comments below!